The new, second-generation Hyundai Genesis sedan has now been available for about a year. People shopping for luxury cars like the new version. So far in 2015, Hyundai has sold better than one-third more Genesis models in the United States than it sold through the same period last year, when the outgoing, prior-generation Genesis sedan was still around. This year’s new model offers a lot of evolutionary improvements over the original Genesis four-door, which Hyundai started selling in 2009. But around here, the boost in popularity comes mainly from the availability of all-wheel drive in the updated model. Before the 2015 version arrived, Hyundai had a hard time selling the luxury sedan in snowy areas, because Genesis is a rear-drive car. That gives it jauntier, more precise and exhilarating handling. But in these parts people shun rear-drive cars because they fear the configuration is harder to control than front-drive models on snowy roads. But the modernized, 2015 model introduced last year brought with it the availability of four-wheel traction. The all-wheel-drive option adds $2,500 to the base price of a Genesis equipped with a V6 engine. (A higher powered, V8 engine available in Genesis doesn’t offer the all-wheel-drive option.) The sedan’s starting price of $38,950 for a rear-drive model bumps only to $41,450 with the addition of all-wheel drive. It’s still a whole lot of car for the money. They’re looking only at the all-wheel-drive version, she affirmed. At the Merrimack Valley dealership shoppers aren’t interested in rear-drive varieties. The Genesis is a top-level, premium sedan that is dramatically styled, solidly built, roomy and accommodating. The re-engineered 2015 four door features better construction, like a more rigid body structure that improves handling and gives the car a more solid and substantial feel. It has a roomier interior than the prior generation. Cabin controls, dials and switches are configured for easy use. The car’s body is re-proportioned, with an elegantly elongated hood and a backward-swept cabin that is gracefully arched. Finished with luster and shine, the Genesis stands out as a luxury car should. Importantly, the next-generation model also packs in the advanced features that luxury drivers clamor for, noted Lagasse. “You get all the same options that other luxury cars have,” she said. A partial list of standard and optional features in the ‘15 Genesis includes head-up display, blind-spot warning, lane-change assist and lane-drift warning, collision warning and automatic braking, automatic high beam headlights, a smart key that automatically opens the trunk hands-free, and parking assistance. A carbon-dioxide monitoring system automatically controls cabin ventilation to maintain an appropriate concentration of oxygen, which can help prevent drivers from getting sleepy. “Prior to this you couldn’t really find features like these in cars at this price point,” Lagasse said. 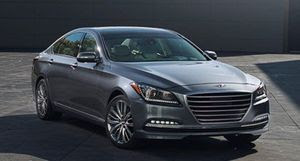 The Hyundai Genesis sells $10,000 to $12,000 lower than comparable cars sold by luxury brands. Comparing all-wheel drive versions, next to the Genesis starting list price of $41,450, the BMW 5 Series starts at $52,250, the Mercedes-Benz E-Class at $54,800, the Infiniti Q70 at $52,000, and the Lexus GS 350 at $50,850. Its affordability attracts some shoppers who are stepping up to a larger car, Lagasse explained. They may not be considering a premium car until they learn that the Genesis offers so much at an approachable price, she said. But at Salem Ford Hyundai, most Genesis buyers are people already driving luxury cars, Lagasse stated. While the Hyundai name doesn’t have the image and status of the luxury brands, the auto’s value along with its abilities prove too irresistible for many of them, she said. “I see people trading in Mercedes and BMWs. Once you get them in a Genesis, once they drive it, they’re sold,” she stated. The Hyundai Genesis remains a marketing experiment. In its engineering, design, construction, performance, comfort, appearance and attitude, the model can justify its claim to luxury-car status. But the Hyundai name that it wears is the badge of a mass-consumer brand, not a luxury brand. BMW and Mercedes-Benz are recognized solely as luxury brands. When other car companies have brought out luxury lines, they have separated them from their mass-consumer brands. Alongside its Chevrolet line, General Motors sells luxury cars under the Cadillac name. Nissan created the Infiniti brand for its luxury offerings. Toyota came out with Lexus. Hyundai maintains that it saves money by keeping the Genesis integrated among its more commonplace cars, because it doesn’t incur the expenses that a separate dealer network would add. That helps explain why the company can sell its luxury car at a lower price. But the approach also keeps away “brand snobs” who purchase luxury goods for the status attached to the names. Still, the Genesis is doing well. With the redesigned 2015 sedan’s growth in popularity, Hyundai sold about 14,750 Genesis models across America through the first five months of the year. The BMW 5 Series and the Mercedes-Benz E-Class are still selling better, at about 20,600 5 Series sales through May and 18,600 E-Class sales. But the Genesis has already surpassed the popularity of the Lexus GS, which sold fewer than 10,000 through May, and the Infiniti Q70, which sold fewer than 5,000. With all-wheel drive now making the Genesis more appealing to drivers like us who experience rough winters, look for it to gain more.